Located in North Philadelphia, Columbia Avenue spans the width of the section of the city from the Schuylkill and Delaware Rivers, running east-west between Delaware Avenue and Thirty-Third Street at the border of East Fairmount Park. Today, the section of the road that runs from 33rd Street to Frankford Avenue has been renamed Cecil B. Moore Avenue. The segment of the street that extends from Frankford Avenue to Delaware Avenue remains Columbia Avenue. Historically, the Columbia Avenue neighborhood has featured a mix of residential homes and small businesses, yet the area underwent several notable shifts in population and demography throughout the nineteenth and twentieth centuries. As early as 1830, large numbers of Jewish Germans and smaller groups of Irish and English began to settle around Columbia Avenue as part of a broader, national trend of European immigration to America. The latter decades of the nineteenth century witnessed an influx of Jewish immigrants of Eastern European descent and, as the neighborhood became more densely populated, many of the original German Jewish settlers left Columbia Avenue for West Philadelphia. Of the predominately Eastern European Jews who remained, many were business owners and merchants who lived above their shops or within a block or two of where they worked. The population of merchants who both lived and worked on Columbia Avenue peaked around the time of the first World War and, as these merchants gained affluence and capital, they too sought better neighborhoods and bigger homes in which to raise their families. 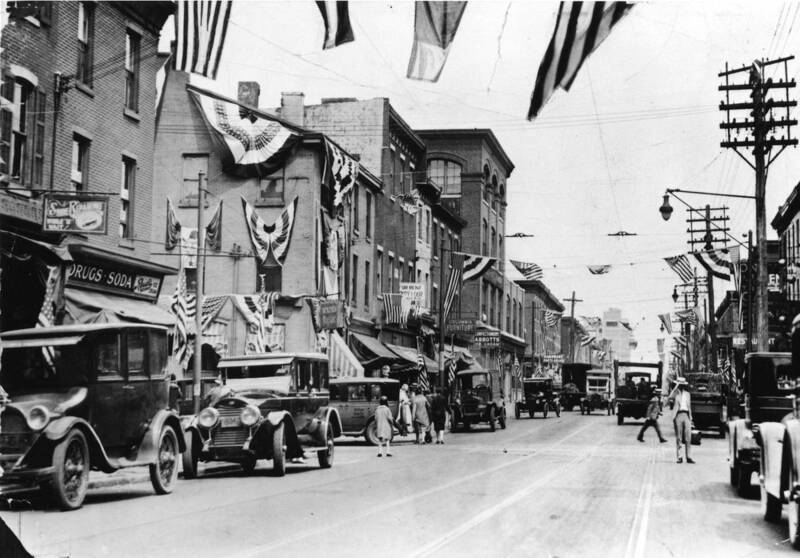 Beginning in the 1920s and continuing into the 1930s, the population of Columbia Avenue evolved, due in part to changing neighborhood dynamics within Philadelphia writ large. As the city’s German Jewish population now left West Philadelphia for the suburbs, Columbia Avenue’s remaining Jewish residents, primarily those of Eastern European descent, departed North Philadelphia and purchased homes in the western section of the city. With the advent of the Great Depression in 1929, population changes slowed, but picked up again as World War II brought greater prosperity to the city and nation. While often keeping their shops on Columbia Avenue, many of the area’s remaining Jewish families mimicked previous emigrations and left for newer homes in West Philadelphia and the suburbs in the 1940s and 50s. Into their place moved a new class of upper and middle-income African-American families, who had historically settled in West Philadelphia. This era was also defined by the changes brought by the Great Migration, as many Southern blacks migrated to the North in search of jobs and economic opportunities. Philadelphia’s black population increased markedly throughout the 1940s and 1950s and brought new dynamics to the city’s neighborhoods. Although Jewish merchants tended to no longer live directly in the Columbia Avenue area, the majority of them maintained their stores and businesses, providing services and employment opportunities to the blacks who moved into the neighborhood. By the 1950s, Columbia Avenue had become a predominantly African-American neighborhood, as another wave of residents gained upwardly mobility and moved away to areas with more space and better opportunities. 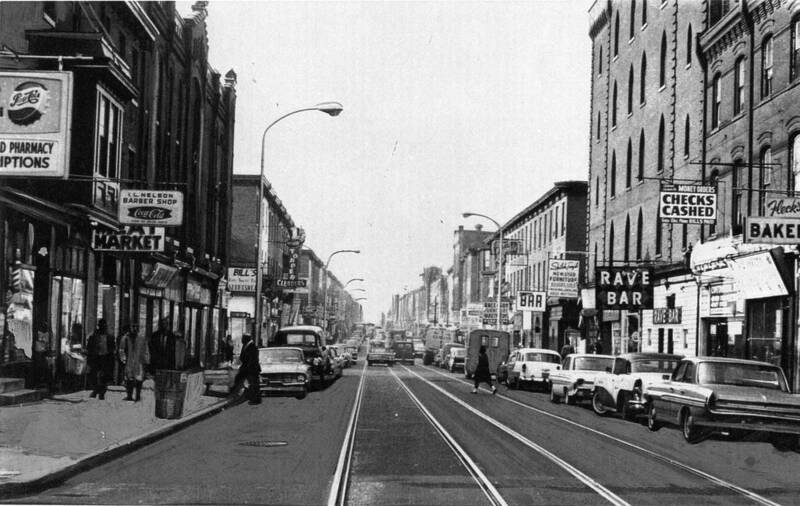 Over time, middle-class African Americans left Columbia Avenue for other areas of the city as well and North Philadelphia largely became home to lower-income blacks who historically resided in South Philadelphia. As the area’s racial and economic make-up began to change, government-initiated urban renewal projects had many unintended side effects and brought devastating changes to Columbia Avenue. Beginning in the early 1950s, urban renewal was a governmental effort to clear economically depressed and blighted neighborhoods in hopes of attracting more businesses and residential real estate developers. However, such enterprises often did not materialize and, in economically depressed areas like Columbia Avenue, led to a proliferation of tenements and public housing units. Additionally, government policies and racial discrimination made getting a mortgage or a loan to fix deteriorating homes nearly impossible and Columbia Avenue increasingly became a largely impoverished neighborhood known as “the Jungle” in reference to its difficult living conditions, which included the city’s highest rates of unemployment and crime. By the 1960s, a little less than half of Philadelphia’s 530,000 African Americans lived in North Philadelphia, where youth generally completed only eight years of schooling and the average income, $3,352 per year, was about thirty percent lower than the city average. And as the civil rights movement failed to adequately address these conditions, racial tensions in the city, and on Columbia Avenue in particular, mounted, as African Americans frequently saw themselves as victims of a biased and unjust white establishment. 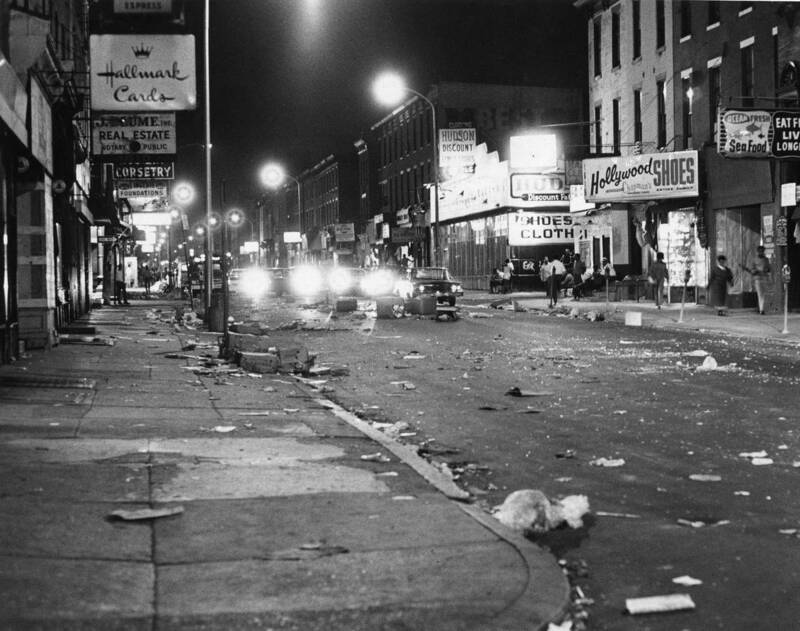 By the summer of 1964, the desire for tangible civil rights progress was palpable and, along with growing tensions between residents and police, provided the spark for race riots in several urban ghettos, including North Philadelphia. 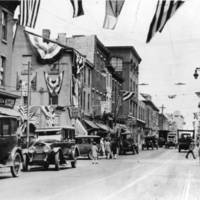 The riots were a turning point in the history of Columbia Avenue, as many of the area’s Jewish merchants feared for their safety and argued that anti-Semitism played a role in the looting and vandalism that occurred. Despite these charges, Lenora E. Berson, the author of a comprehensive study on the riots, argued that the primary target was the white establishment, which on Columbia Avenue happened to be predominately Jewish. Nonetheless, many Jewish merchants left the neighborhood in the 1960s and 1970s and some were replaced by black business owners. However, operating an independent business in an impoverished area frequently proved untenable and many businesses failed or closed. During the 1970s and 80s, the area underwent several neighborhood revitalization projects with varying degrees of success and, despite these efforts and some improvements, the community economy never fully recovered. 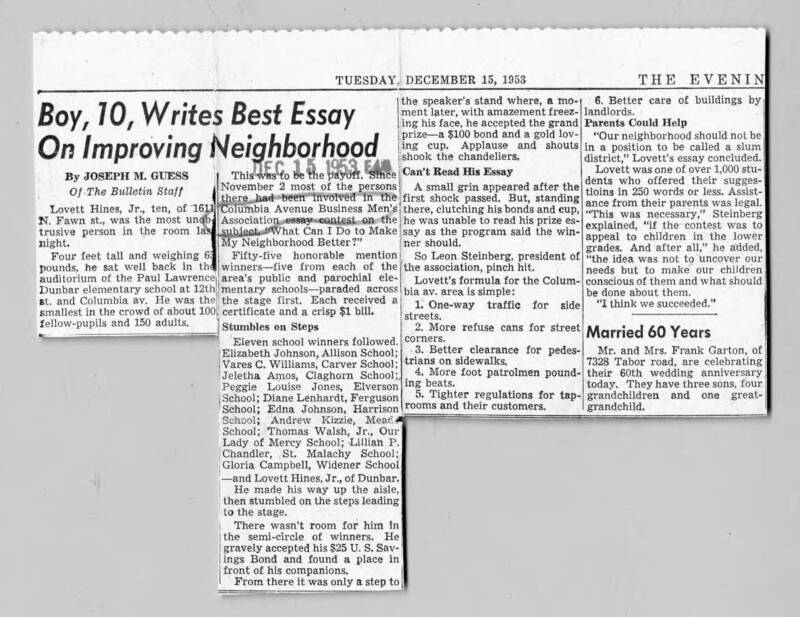 In 1987, Columbia Avenue was renamed Cecil B. Moore Avenue in honor of the famed civil rights leader who dedicated himself to improving the lives of the neighborhood’s residents. Today, the area, while still home to some vacant lots and abandoned buildings, has reinvigorated somewhat due to an influx of Asian and African immigrants, as well as a vital population of students who attend Temple University, and many young families. Alongside residential blocks, there are restaurants, religious organizations, and businesses to serve those who live in the Columbia Avenue neighborhood. To view primary source materials about Columbia Avenue and other topics in Philadelphia's civil rights history, search our collections. “Jewish Community Relations Council--Survey of Jewish Merchants--Preliminary Data (1966-1970).” Folder 022, box 14, Mss. 155. Jewish Community Relations Council records. Urban Archives, Temple University Libraries, Philadelphia, PA.
Levenstein, Lisa. A Movement without Marches: African American Women and the Politics of Poverty in Postwar Philadelphia. Chapel Hill, NC: The University of North Carolina Press, 2009. “Riots in Northern Philadelphia--1964-1965.” Folder 015, box 47, Mss. 155. Jewish Community Relations Council records. Urban Archives, Temple University Libraries, Philadelphia, PA.